Homeowners face many risks, all of them costly. Fires, burglaries, leaks, and injuries are some of the risks that homeowners face,thus requiring mitigation. Insurance provides necessary protection and at Wright, Finnegan, and Sommer Insurance Associates, we tailor a comprehensive homeowners insurance program to our California neighbors. We customize solutions through this program for individual clients, and, as a result, you’ll be fully secure for the right price. Whether you're the only occupant of a single-room home or you own a high value home with many occupants, we’ll help you. 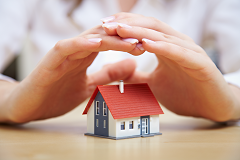 Homeowners insurance protects against damages to dwelling structures, its belongings and basic liabilities. The security provided by these policies can sometimes be inadequate based on your specific needs. Most homeowners add coverages to their policies, and at Wright, Finnegan, and Sommer Insurance Associates, we’ll help you find the right coverages and ensure that your policy fits. In most cases, homeowners can save money on their insurance by combining coverage with auto insurance. Just see our home & auto page and/or speak with an agent to learn more. We’ve insured California homeowners for a long time and know these individuals’ needs. We meet their needs by providing tailored products and personalized services. As a result, the homeowners whom we serve stay fully covered in cost-effective ways. We manage risk and claims and we’re reachable whenever you want or need to get a hold of us. Please contact us or give us a call to learn more about your options. If you’re ready to get started, request a quote today. Wright, Finnegan, and Carter Insurance Associates provides Home Insurance for residents near Yorba Linda, Placentia, Anaheim, Orange, Chino Hills, and La Habra.